If you were planning a six month voyage visiting the countries linked to the Indian Ocean, you'd probably include a fair bit of beach time and think it fair enough to do so. It's called 'taking a holiday'. 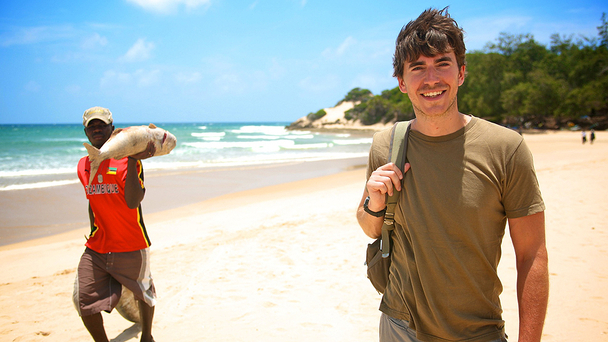 But not intrepid journalist Simon Reeve. In his six-part Sunday night travelogue-arama-fest, Indian Ocean with Simon Reeve - and there aren't many people who'd get equal billing with an ocean - he's taking it all admirably seriously, despite occasionally looking like he's in a more restrained version of a 1990s Take That video, with a rucksack. But what's even better is his inquisitive and slightly wide-eyed boy-scout enthusiasm, probably because he knows what a great job he has. And even though he's not on holiday, he's acknowledged in interviews for the programme that he has to visit the holiday destinations in the area, as much as he has to visit the bad parts. Y'know, in the interests of balance and that. of a 1990s Take That video, with a rucksack'. Sort of. He's hardly travelling first class: so far we've seen him hitching a lift in a container ship under threat of a pirate attack (and not the fun kind of 'shiver me timbers' pirates, either); helping to dig out the wheels of a stranded jeep while maintaining on-camera good spirits, and holding on for dear life on a speed boat in pursuit of poachers, which also messed up his hair and left it looking a bit ruffled but he's a trouper so he won't complain. 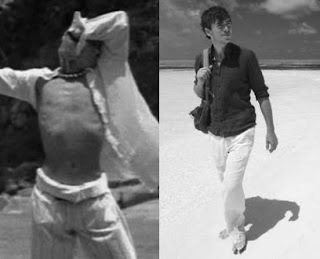 He even gave a polite if uncomfortable chuckle when his guide in Mozambique, Carlos, suggested that one of the best things about the place was the 'very beautiful women'. Simon was clearly hoping his wife would be in the kitchen when that bit goes out. So it's not all amazing beaches then, this Indian Ocean, and some of the parts we saw were grimly captivating, like the abandoned hotel now home to thousands of people who'd otherwise be homeless, or the trade in shark fins to make soup for the Chinese. By showing us these bits, it's almost as if he wants to bat away the inevitable criticisms of the 'it's alright for some' variety before they even arrive. And that fact, and perhaps a genuine lack of vanity, mean his decision to include the scene where he sits with a group of men as they smoke heroin in a drug den in a dangerous part of Cape Town in South Africa is a an understandable one. "Is that real gun? Yes? Oh dear." He looks absolutely genuinely terrified, and watching it, you're relieved as he is to be out of there before he accidentally inhales and decides to elope with a local, never to be seen again. 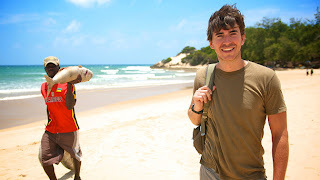 Tv-ooh is going to enjoy watching Simon mill his way around the Indian Ocean in his olive green t-shirt and rucksack and happy-go-lucky journalistic-edged charm. And remember viewers, it IS NOT A HOLIDAY.